When handled correctly in the field and in the kitchen, venison can be tastier than domestically raised meat. The key is to keep it cool and dry immediately after harvest. And then, the real poetry begins in the aging of that meat. If you can hang that meat for three to six days, some of the enzymes in the meat start to break it down, and you really get that tender, good tasting, concentrated flavor. Lee Smith is a hunter and home cook from Austin, Texas. To store fresh venison, Smith recommends vacuum sealers, which keep meat usable for up to a year in the freezer. And when you’re ready for it, Smith says – simple preparations are best. You’re legally – depending upon what county you’re hunting in – able to take five deer in Texas. And that can be a lot of meat. So, I can understand after a while, how you might want to change it up and have a little horseradish sauce, or some kind of port reduction with some mushrooms. But, I want to taste the meat; I don’t want to throw a heavy sauce on it. In fact, tonight, we’re having venison fajitas. 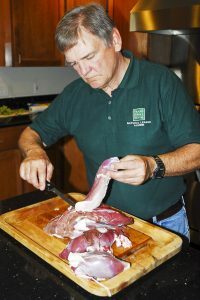 Lee Smith says he usually marinates venison back strap briefly in olive oil and soy sauce, grills it, and ends up with something the whole family enjoys. Find wild game recipes on the Texas Parks and Wildlife website. This entry was posted on Tuesday, November 6th, 2018 at 12:00 am	and is filed under Food, Venison. You can follow any responses to this entry through the RSS 2.0 feed. You can skip to the end and leave a response. Pinging is currently not allowed.